Patrick took me to one of our local nurseries yesterday, and i finally found a solution to my bird bath problem. 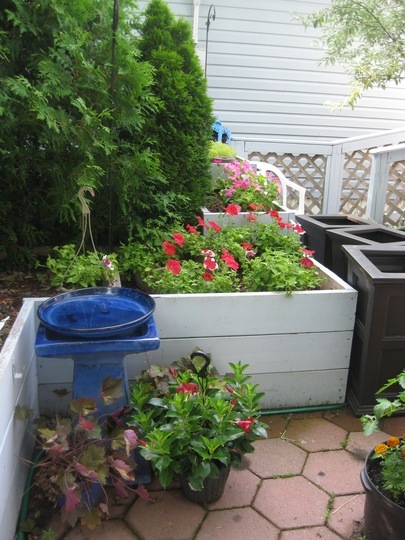 i bought the pedestal many years ago..love the colour, but when i got it home, i realized it was useless.it’s too deep for the birds, and the sides are too steep and slippery..because there’s no drain hole, i couldn’t use it as a planter..i tried everything i could think of..if i just left it standing, it became a mosquito nursery..if i filled it with sand and pebbles, the rain and sprinkler made a mess of it, but i still wanted to keep it..cost me a fortune, too..however, it’s now a functioning bath..i’ve put it in a corner where it’s just visible from the road, and where i can see it from my shady corner..i’ve temporarily put some coral bells around it to see how they like that spot..don’t know what the other plant is, it was a surprise gift from Patrick..the big saucer i bought is an exact match..same colour, same ceramic material..i’m thrilled!i also bought 4 lemon balm plants, very healthy, and 9 bags of container soil, that Patrick put in the courtyard for me. 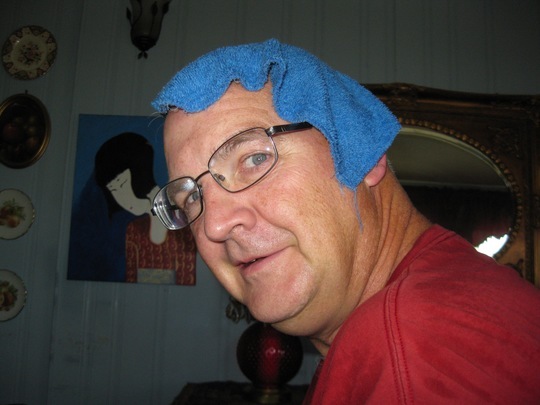 After he finished, he came inside to cool off, and i gave him a wet facecloth to wipe the sweat off..it was SO HOT out there.it felt so refreshing, he wore it on his head for awhile..hence the funny photo..we had a good laugh together..needs does as needs must, eh? 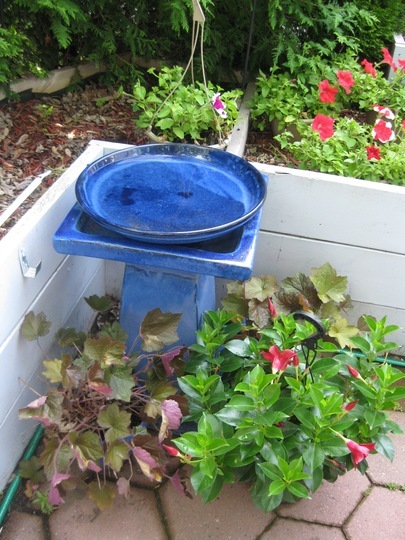 Previous post: Looking for suggestions..
Nice colour on your birdbath. I'm glad you've solved the problem. What a shame a pigeon didn't fancy that wet cloth. A video could have made that TV programme that pays £250 ! Your container plants are very colourful. That's a great solution - have the birds found it yet? Glad you found a good place for the bird bath, it's lovely. Nice way to cool down. Eirlys..i could use that money, too..
Steragram..i haven't seen any birds there yet, but a squirrel found it right quick..thanks for the tip..if i find a suitable stone, i'll use that, and then i'll have 2 baths..can't have too many in this heat..
and the blue colour suits Patrick too ! I've added this to GoYpedia feature ideas.